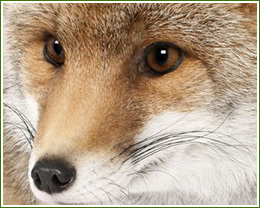 Animal Pros Fox removal specialists perform humane fox trapping that is safe for your family and pets. Our humane solutions are necessary in residential settings where other trapping methods can be a liability. 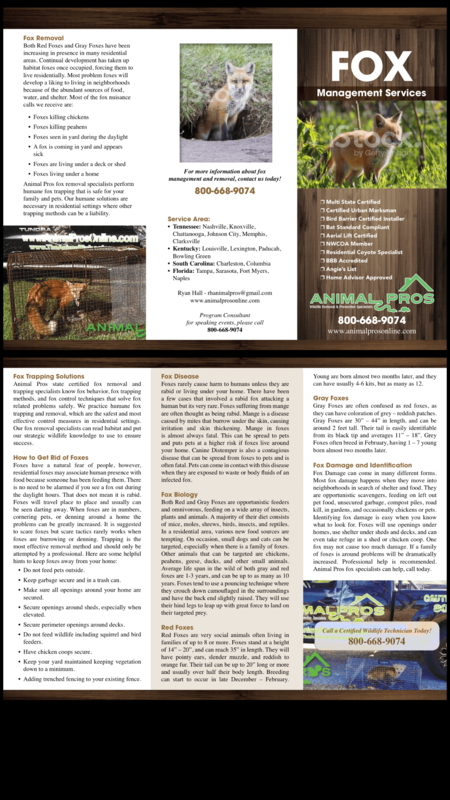 Animal Pros state certified fox removal and trapping specialist know fox behavior, fox trapping, and fox control techniques, to solve a fox related problem safely, to protect your family and pets. We practice humane fox trapping and removal, which is the safest and most effective control measures in residential settings. Our Fox Removal specialist can read habitat, and put our strategic wildlife knowledge to use to ensure successful trapping measures. Foxes have a natural fear of people, however residential foxes may associate human presence with food, if someone has been feeding foxes.There is no need to be alarmed if you see a fox out during the daylight hours. That does not mean it is rabid. Foxes will travel place to place, and usually can be seen darting away. When foxes are in numbers, and cornering pets, or denning around a home, the problems can be greatly increased. It is suggested to scare foxes, but scare tactics rarely works when foxes are burrowing or denning. Trapping is the most effective removal method, and should only be attempted by a professional. Here is some helpful hints to keep foxes away from your home. Keep garbage secure and in a trash can. Secure openings around sheds, especially when elevated. Secure perimeter openings around decks. Do not feed wildlife including squirrel and bird feeders. Keep your yard maintained, keeping vegetation down to a minimum. Adding trenched fencing to your existing fence. Diet: Omnivorous, eating a majority of animal matter. Breeding: Starts in Janruary and February. Reproduction: 4-7 pups born annually starting in late March or April. Habitat: Urban areas with the availability of food water and shelter, fence rows, drainage ditches, under sheds, and dense green spaces. Legal Status: Common throughout Tennessee, and hunted and trapped according to the Tennessee Wildlife Resources Agency regulations. Other Names: Often mistaken for coyotes, Fox, Silver Fox, Red Fox, and Grey Fox. Interesting Facts: Red Foxes can be distinguished from Grey Foxes by the white tip on a Red Foxes tail. Red Foxes will dominate over other fox species. Foxes rarely cause harm to humans, unless they are rabid, or living under your home. There have been a few cases that involved a rabid fox attacking a human, but very rare. Foxes suffering from mange are often thought as being rabid. Mange is disease caused by mites that burrow under the skin, causing irritation, and skin thickening. Mange in foxes is almost always fatal. This can be spread to pets, and puts pets at a higher risk if foxes live around your home. Canine Distemper is also a contagious disease that can be spread from foxes to pets, and is often fatal. Pets can come in contact with this disease when they have exposure to waste or body fluids of a infected fox. Both Red and Gray Foxes are opportunistic feeders and omnivorous, feeding on a wide array of insects, plants, and animals. A majority of their diet consists of mice, moles, shrews, birds, insects, and reptiles. In a residential area, new opportunities present itself as a food source. On occasion, small dogs and cats can be targeted, especially when there is a family of foxes. Other animals that can be targeted is chickens, peahens, geese, ducks, and other small animals. Average life span in the wild of both gray and red foxes is 1-3 years, and can be up to as many as 10 years. Foxes tend to use a pouncing technique where they crouch down camouflaged in the surroundings, and have the back end slightly raised. They will use their hind legs to leap up with great force to land on their targeted prey. Red Foxes are very social animals often living in families of up to 8 or more. Foxes stand at a height of 14″ – 20″, and can reach 35″ in length. They will have pointy ears, slender muzzle, and reddish to orangish fur. Their tail can be up to 20″ long or more and usually over half their body length. Breeding can start to occur in late December – February. Young are born almost two months later, and they can have usually 4-6 kits, but as many as 12. Gray Foxes are often confused as red foxes, as they can have coloration of grey – reddish patches. Gray Foxes are 30″ – 44″ in length, and can be around 2ft tall. Their tail is easily identifiable from its black tip and averages 11″ – 18″. Grey Foxes often breed in February, having 1 – 7 young born almost two months later. Fox Damage can come in many different forms. Most fox damage happens when they move into neighborhoods in search of shelter and food. They are opportunistic scavengers, feeding on left out pet food, unsecured garbage, compost piles, road kill, in gardens, and occasionally chickens or pets. Identifying fox damage is easy when you know what to look for. Foxes will use openings under homes, use shelter under sheds and decks, and can even take refuge in a shed or chicken coop. One fox may not cause too much damage. If a family of foxes are around problems will be dramatically increased. Professional help is recommended. 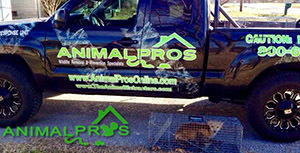 Animal Pros fox specialists can help, call today.